How did your uncle the great Nusrat Fateh Ali Khan inspire your shared passion for music, and to take up singing as a full-time career? We were always inspired by our Uncle Nusrat Fateh Ali Khan as the entire singing of our family is different from that others and his technique has always been inspirational to us. He sang the most difficult compositions in such an easy way that even the person who does not understand the dynamics of singing will be able to enjoy hearing them. In your own terms, how do you think the style of Qawwali differentiates itself from other genres of music? Qawwali is basically a spiritual type of music but now it has become so popular among social events, as opposed to when it was limited to shrines. This is all thanks to our ancestors. Now, a lot of contemporary songs are also sung in the Qawwali style. 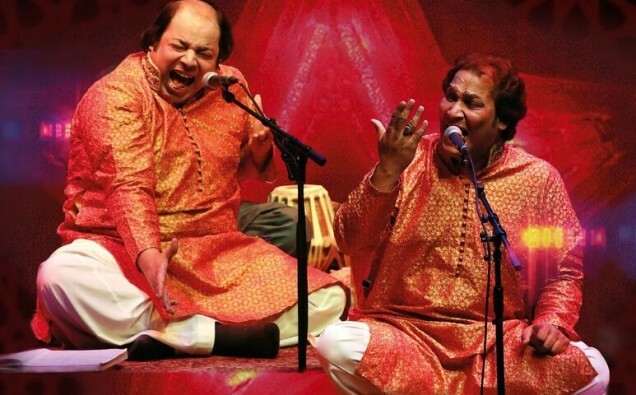 Qawwali singing is more focused on lyrics as well as instrumental tones which, has developed more meanings for audiences and generate a greater variety of responses. What is the largest audience you’ve played in front of and what kind of turn-out are you expecting from your UK Tour in March 2019? We have performed in front of as many as 20,000 people at Womad festival several times, and 30,000 people at Roskilde festival twice, and likewise many other festivals as well. We expect a good turn- out in March 2019 as we had mostly sold out shows back in March 2017, where our Barbican performance was live streamed to over 1 million people. What instruments and musical sounds can we expect to hear alongside the traditional Sufi music on your tour? We are trying to keep the Qawwali and our family tradition alive. Therefore you will only see the traditional instruments Harmoniums, tablas and hand clapping, etc. These traditional instruments have a much more mesmerising effect than any extra instruments. Does either of you have a favourite song among the classics and Nusrat repertoire that you love to perform? We love all of his songs and it’s very difficult to choose one among all of the rest. However, we will be performing Nusrat’s qawwalis live, which have been much less sung and some audience members may not have listened to them before. Can you list any inspirations for your devotional and mystical music and the accompanying lyrics? There are many, as follows: YahayyoyaQayum, Bibasadadilmordey, Main to peyaseynainamilaairey, Munkuntomaula, Nami da numcheymanzil, Ishqeycheykirakheya, and many more. Is there a particular artist or group you would like to collaborate with the most? We are always interested to collaborate with any talented artist. We have collaborated with Temple of Sounds, Fundamental, Susheela Ramanand many more. Do you have any new songs or upcoming projects that you’re working on at the moment? We will have some new songs on the tour and also I (Muazzam Ali Khan) have released a solo song myself called ‘Ishqa‘, and have some more on the way.